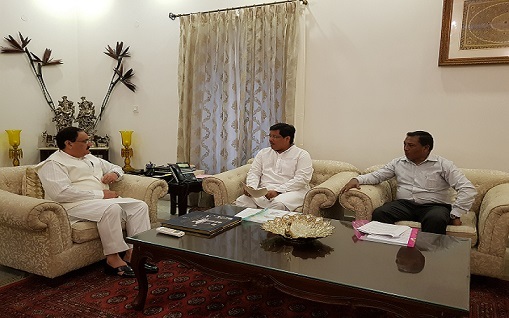 Meghalaya Chief Minister Conrad K Sangma called on Union Health and Family Welfare Minister Jagat Prakash Nadda with state health minister A L Hek at his residence in New Delhi in presence of officials from the Ministry of Health and Family Welfare. The meeting with Nadda was fruitful and positive as he assured to extend all possible support from the Ministry to enhance medical services in the state. During the meeting a slew of development initiatives with regards to improvement of health infrastructure in Meghalaya were discussed at length. A memorandum to this effect was submitted by the chief minister and health Minister. Meghalaya health minister A L Hek apprised the Union Minister that critical infrastructure is being created with the support of the centre. Hek also sought Union Minister’s intervention on setting up an Anti-Retroviral Therapy (ART) Centre at Jowai. Nadda has assured that all support from the Ministry will be provided to Meghalaya for providing care to HIV/AIDS patients. Meghalaya Chief Minister apprised Union Health Minister on the recently passed Free Drugs Policy by the State government and has sought for additional funds for purchase of notified life saving drugs. Issue related to upgradation of several PHCs, CHCs and sub-health centres were discussed at length with specific request for upgradation of Ganesh Das Hospital Shillong and infrastructure support for Cancer Care Wing in the State. A special request was also made for setting up of specialized physiotherapy and sports injury centre in the State with regards to the upcoming National Games in Meghalaya in 2022. Union Health Minister has assured that all support to impart training would be provided by the Ministry of Health and Family Welfare.